Padded mirror frames soften a bedroom or dressing vanity table. They make lovely additions to your room's decor and are easy to make. Most any framed mirror can be transformed with a padded mirror frame. Making a padded mirror frame uses very little fabric, so you will have the opportunity to use more elegant and expensive fabric if you choose. These instructions use one solid sheet of fabric for the covering on your padded mirror frame, however, you may piece smaller amounts of fabric together to achieve the covering you will need. Remove the mirror from its frame and carefully set aside. Most mirrors are held in by staples, twisting knobs or glass points, all of which are easily removable. Lay the fabric out on your ironing surface. Iron any wrinkles or creases from the fabric and place on your work surface with the wrong side up. Center and place the mirror frame over the top of the fabric. Allowing for the thickness of the frame, draw a line around the frame allowing for a 1 inch overlap to the back of the frame. 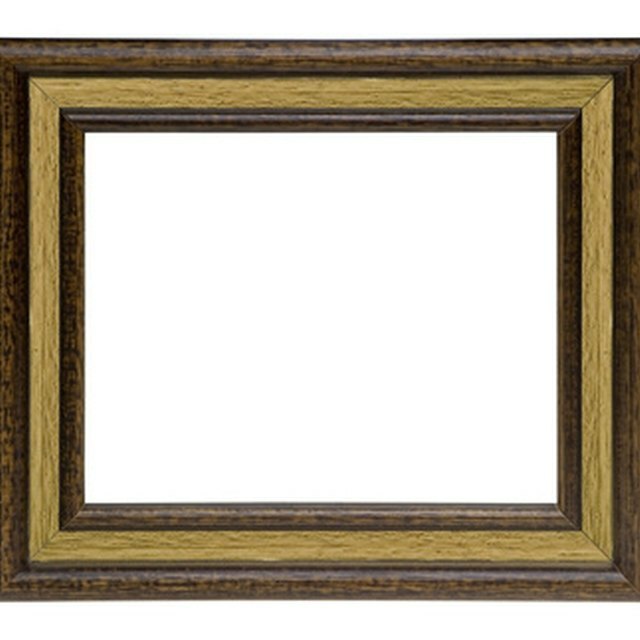 For example, if the frame has a thickness of a 1/2 inch, then draw your line 1 1/2 inches from the edge of the frame. Draw a line around the inside of the frame in the same manner. Cut the fabric out on the line and set aside. Lay the quilt batting out flat on your work surface. Center and place the mirror frame over the top of the batting. Using a marker, draw around the frame using the same technique as in step 2. Cut the batting out on the line. Place the mirror frame on your work surface right side up. Apply craft glue over the top of the mirror frame. Turn the mirror frame over and place on the cut quilt batting. Center and match the frame on the quilt batting. Apply hot glue to the edge of the mirror frame on the back. Fold the quilt batting to the back and secure in the glue. Pay close attention and do not create too much bulk on the inset for the mirror. Lay the cut fabric for the padded mirror frame on your work surface with the wrong side up. Make tiny cuts around the outside and inside of the cut fabric frame. These cuts should be approximately 1 inch long and made every 1/4 inch to a 1/2 inch around the fabric edge. Apply craft glue on the edge of the mirror frame on the back. Fold the cut fabric frame to the back securing the cut tabs in the glue. Again, pay close attention and do not create too much bulk on the inset for the mirror. Allow the glue to dry. Return the mirror to the frame and reattach. Look for framed mirrors that are smooth or with little detail and straight lines. Since the frame will be padded, a carved mirror frame will work fine for this project.